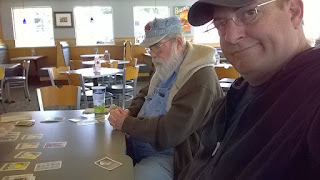 Earlier this week, Kurt joined the Culver's gang to play a few card games including a Love Letter variant and High Society. 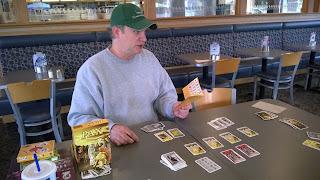 He even stuck around after the lunchtime bunch took off so we thought we'd try a game of Pax (2011). 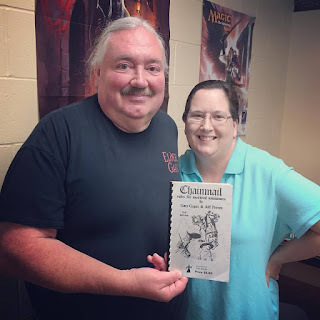 None of the three of us playing had played before and Kurt had only looked over the rules a couple times, so we worked our way through it a bit at a time. Enter Rome at the time of the slave uprisings under Spartacus! The escaped rebels have managed to gain influence and power. Rome is attempting to undermine the stronger armies of the slaves in order to restore "pax", or peace – but only for personal gain. The players play the part of the escaped slaves who try to increase their sphere of influence and undermine the Roman establishment. Using their cards, they expand their power in seven different categories. At the end of the game, each player tries to be stronger than Rome - and, of course, stronger than any opponent. Through intrigue, however, a player can join forces with Rome and thus contribute to its victory over the slave revolt. 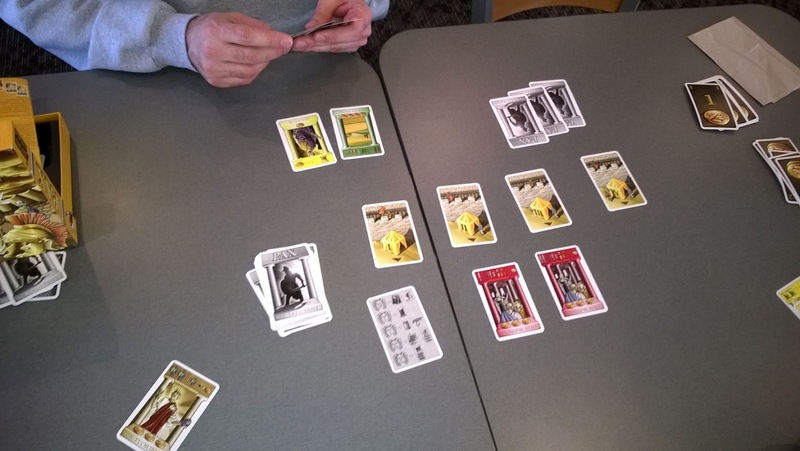 PAX is a multi-faceted game of card management and influence in which each card requires a tricky tactical decision. 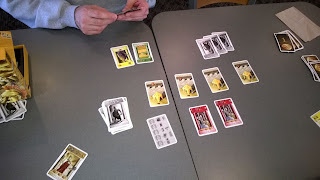 With two copies of the game, up to eight players can compete for a foothold in the Roman Empire. I enjoyed the complexity of this game and like that it is both cooperative and competitive at the same time. That puts the leading player, as much as that can be discerned, in a position where they need to step up and keep everyone in the game. The decision-making that takes place combined with the limited information each player has leads to some difficult choices.I'll need to play this a few more times with some players of the same or more experience than myself to fully appreciate this game but I am already keen to give it at least several more attempts. I like the theme, art, and combination of mechanics. Good stuff!